Ben's Journal: Can your backpack do this? I love the Sea to Summit foldable bag - folds down to nothing, holds a ton and is surprisingly durable. Today, I grabbed it to hold my usual pocket contents while on a bike ride. Alas, the 96° temperature made wearing the backpack remarkably uncomfortable. 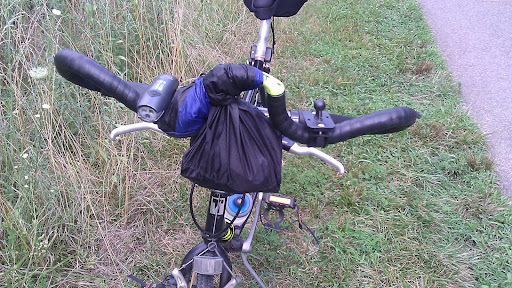 Not a problem, I hopped off my bike and wrapped the bag around my handlebars. 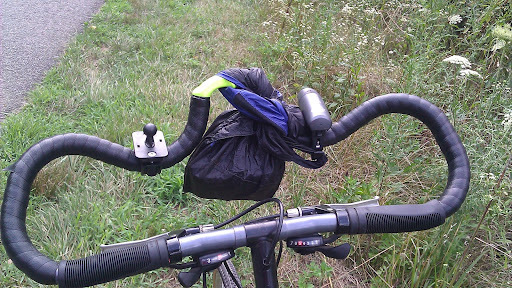 It worked quite well as a temporary handlebar bag, and getting airflow to my back made for a much more pleasant ride. Of course, I'm not going to win any fashion contests with this setup, that's for sure. Score another point for this great little bag.